Nano-technology and nano-materials have become an extremely active field of research in the last decade, because of their potential application in different areas like medicine, information technologies, energy storage etc. The unique properties of nano-sized particles, which are subject of quantum mechanics, determine the great interest. The main purpose of using nano-technologies in dental materials is achieving higher mechanical properties, higher abrasion resistance and less shrinkage of dental composites, improved optical and aesthetic properties of composites and ceramics. Till now the nano-technologies are used in production of wide range of dental materials: light polymerization composites and their bonding systems, imprint materials, ceramics, coatings for dental implants and bioceramics. 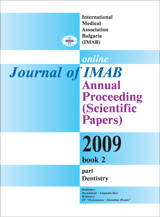 The aim of this paper is to make an overview of nano-materials, designed for and used in the practice of dental medicine. Key words: laboratory composites, Adoro, Vectris, post-monoblock overlay.